Flower of the Month Club - 6 months by Clubs of America - Monthly Gift Clubs at Smokey Robinson Foods. Hurry! Limited time offer. Offer valid only while supplies last. Fresh from the gardens of the world's best growers, our Flower of the Month selections include some of the finest and rarest varieties to be found. Fresh from the gardens of the world's best growers, our Flower of the Month selections include some of the finest and rarest varieties to be found. Past selections have included: Peruvian Lillies Dendrobium Orchids Red Anthuriums Proteas Lisianthus Birds of Paradise Specializing in preserving and cultivating exotic varieties, our exclusive network of growers truly appreciates natural botanical beauty. From lush tropicals to delicate mountain blooms, your monthly flowers are a presentation of care, love and dedication. 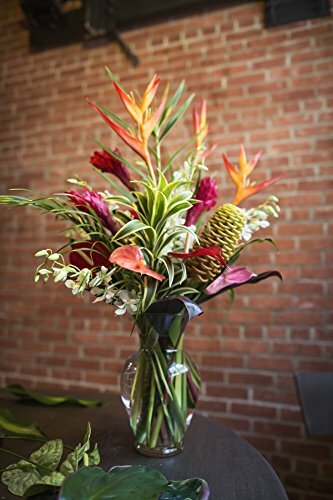 As a member of our Flower of the Month Club, you or a loved one will look forward to each delicate delivery of exotic arrangements. From brightening the day and enhancing the atmosphere, to telling that special someone how you really feel, there's no better way to enjoy nature's beauty. Bursting with vibrant blooms and fresh fragrance, each delivery is hand-selected and arranged for you. Your gift package will also include our monthly Flower Expeditions newsletter with information about the flowers in your bouquet and instructions for their care. First-time members also enjoy an optional glass vase with their first delivery to help showcase selections. You will receive a fresh cut and unique bouquet of flowers shipped directly from our growers and delivered right to your door each month. 100% Satisfaction Guaranteed. We stand by our service and you won't find anybody better!